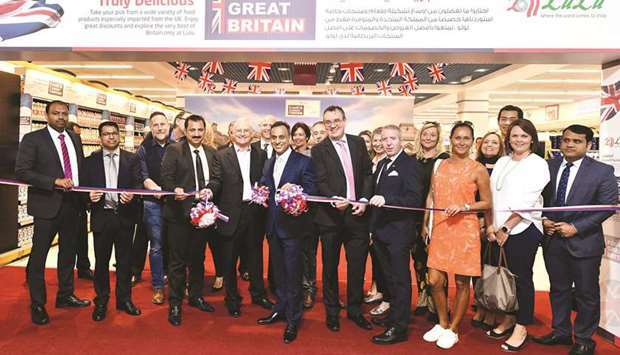 LuLu Hypermarket Qatar is holding British Food Festival 2019 across all its outlets in Qatar as part of the ongoing ‘Food is Great Britain’ initiative across the region. The festival was inaugurated by British ambassador to Qatar, Ajay Sharma, at LuLu Hypermarket, Al Messila, on Sunday. Dignitaries from the British embassy’s Department for International Trade/Invest Northern Ireland and Qatar British Business Forum joined the ribbon-cutting ceremony with a host of other officials and dignitaries from banks, schools and the retail/FMCG sectors. Children from Sherborne Qatar took part in the inaugural ceremony with live musical performances. The store was decorated with the British flag and pictorial representations of iconic landmarks of Great Britain. The event serves as a platform to highlight and promote the culinary heritage, food and the best of British brands among the local community and expatriates in the region, LuLu Hypermarket Qatar has said in a statement. The festival showcases major food and food products of the UK. More than 5,000 products imported from the UK and across various categories, including chilled and frozen food, fish, cheese, dairy products, plain and flavoured yogurts, hot food, groceries, confectionery, fruits and vegetables, delicatessen, canned foods, diabetic-friendly, gluten-free and organic items, household and health and beauty have been exhibited. Customers have the opportunity “to explore the culinary delights, understand the outstanding quality of British food and understand the lifestyle of Britain”, the statement notes. LuLu Hypermarket Qatar has been organising the British Food Festival for several years, and the current edition is taking place until March 23 at all LuLu outlets in the region. Meanwhile, the statement also points out that the first export distribution centre of LuLu Hypermarket in Birmingham — Y International (UK) Ltd — was set up in 2013. “Considering the 10-fold growth within a short span of time, the company has invested in a new 160,000sq ft European headquarters in Birmingham’s Advanced Manufacturing Hub, which will be functional by the last quarter of this year. The management has stated that this will create further job opportunities for the local community. In 2017, Y International was awarded the prestigious ‘Queen’s Award for Enterprise: International Trade 2017’ for its “exceptional contribution to the UK’s trade, industry and economy”.